So…you’ve been seriously looking at homes of interest with your real estate broker for some time now and you’ve just come across a property that looks good and feels right and you’re interested in making an offer. BUT…you’re not 100% sure you want to buy this property because there are a few issues that you discovered when you went back to see it for a second time. ON THE OTHER HAND…you really like this one – it speaks to you and in many ways it’s just perfect for you. What to do? What to do? Your broker recognizes your interest and recommends that you consider making an offer on the property. The broker prepares a value opinion for you and suggests a price to offer and possibly a negotiation strategy. But still there are those nagging unresolved issues and unknowns that are holding you back. 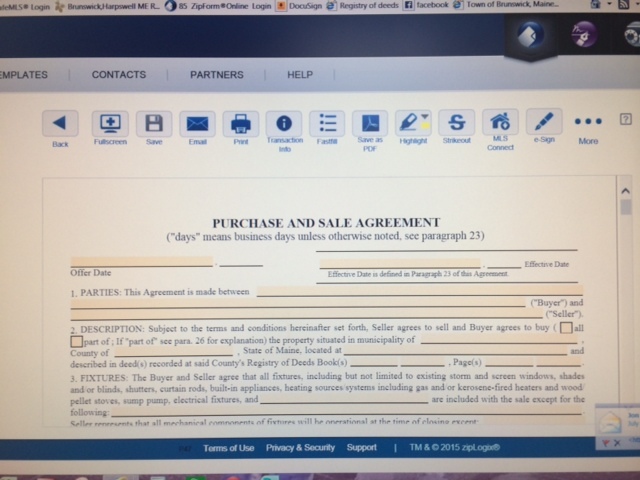 The answer could be found in the Purchase & Sale Agreement or P&S as it is commonly called. revealed to both Buyer and Seller during the time the property is under agreement to be sold. For the Buyer, the early stage of a valid Purchase & Sale Agreement is more of an “option to buy” period than a firm and final agreement. For example, if the Buyer is dissatisfied with the results of any property inspection, the Buyer might attempt to renegotiate the agreed upon price of the property – or even withdraw from the contract if the Buyer cannot come to an agreement with the Seller. Or, if for some reason the Buyer can’t obtain financing, the Buyer can typically cancel or “void” the contract and receive a refund of any deposit (earnest money) that the buyer has made, if done in a timely manner. If the Buyer is satisfied with property inspections and financing is approved, those contingencies can be released or may expire and both parties can move forward to close on the property. Therefore, it is not necessary to be 100% sold on a property in order to move forward with a Purchase & Sale Agreement. In fact, it is typically very important for a Buyer to act quickly on a property of particular interest as a valid contract on the property will “take the property off the market” so that competition from other buyers will be eliminated for a time while the Buyer seeks financing, conducts property inspections and becomes more familiar with the property. So Buyers don’t necessarily need to know everything about a property of interest before they make a decision to move forward and make an offer as the Purchase & Sale Agreement will generally allow the time necessary to learn and discover more about the property prior to full commitment. Edward Nista has been a Maine real estate Broker for 24 years, formerly a carpenter/building contractor.